I did read Into the Woods by Tana French. Halfway through I was so enjoying this book I downloaded the next one to my kindle. I really had to hold off from downloading them all right away. So December consisted of 2 Tana French books…Into the Woods and The likeness. I really, really enjoyed these books and am so pleased Jennifer put her latest one on her blog and gave me pause to consider them! I found the way she develops her characters intriguing and I like how the books are connected but not dependent on each other. I’m holding off binging on all of her novels so I can look forward to the next pones…I also finally finished Stephen Fry’s autobiography. It wasn’t as good as his other stuff. ‘Nuff said. 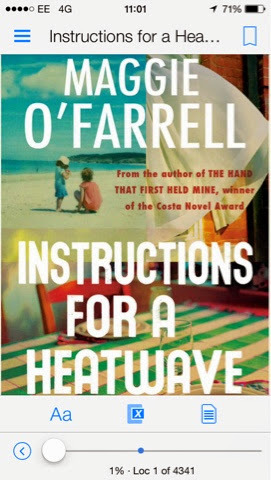 So this month, and yes I understand it being almost February, I’ve been reading Maggie O’Farrell’s “Instructions for a Heatwave” and plan to read Jay Rayner’s “The Apologist” and potentially a new Simon Kernick novel... If I can stop myself from the third Tana French book….. I'm so glad you liked Tana French! I'm hooked. I keep recommending her to people and nobody ever takes my suggestion, ha. I think she's fantastic!